Winds may be gone but not the threat of wildfires in Southern California. Finally there is a light at the end of the tunnel and it isn't the bright light of another brush fire. The good news is the Santa Ana winds have died down significantly. The bad news is that it is still scorching hot in many parts of San Diego County and the fire danger remains extremely high. 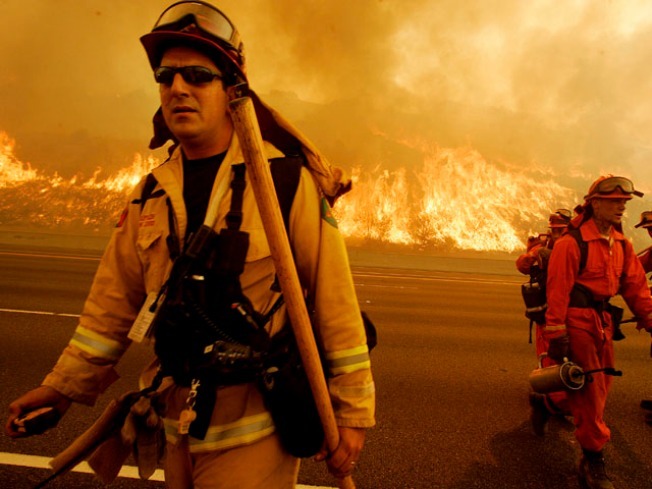 The waning winds are great news for the hundreds of firefighters battling three separate blazes to our north in Orange and Los Angeles Counties. Without the strong northeast winds that gusted to more than 70 mph on Thursday and Friday, flames spread slower making it easier for the firefighters to fight them. CalFire said they are ready for any fires in San Diego. According to a spokesman, the agency is staffed with a higher number of personnel than normal, despite sending resources to the Los Angeles area over the weekend. CalFire sent five local engines to the north, but they are staffing volunteer and reserve engines to more than make up for the difference. Here are the numbers: CalFire is currently operating with 27 engines, seven water tenders, two bulldozers and 13 hand crews made up of 17 crew members each. Air resources include the two Super Scoopers on loan from Canada, three air tankers, and five helicopters -- two from the county, two from the city and one federal helicopter. Additionally, several strike teams were sent to the Los Angeles area from various San Diego count areas. How long they'll remain there depends on current progress of the fires. The CalFire spokesman said the agency will remain at current staffing levels until there's a long term break in the weather, or at least two of the three major fires burning to the north of us are 100 percent contained. Over the weekend, many areas around the county set or tied daily records for maximum temperatures. Sunday's record 96 in El Cajon was not only the hottest temperature in the county it was the hottest temperature in the entire country. We're expecting to once again be in or near record territory this afternoon but should start cooling off Tuesday. By Monday night, the high pressure that caused the Santa Ana should move far enough east that we expect to see the on-shore breezes return on Tuesday. The forecast is calling for temperatures to be as much as 10 degrees cooler with another ten degree drop off for Wednesday.